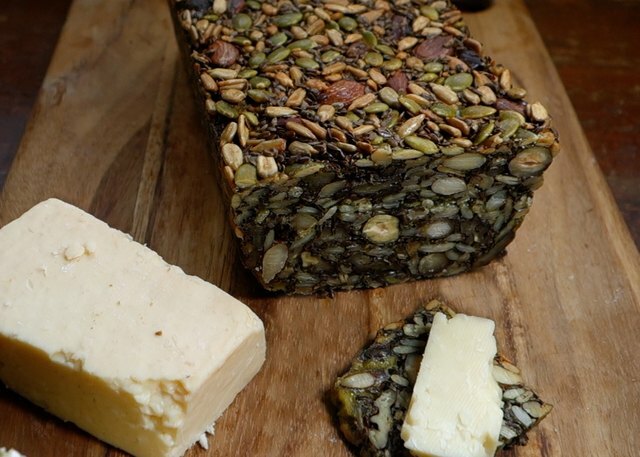 Nordic “Stone Age” bread made from whole nuts and seeds. this bread was created by the staff at Kong Hans restaurant in Copenhagen after they embraced the Paleo diet. Since then, it’s become a hit in Denmark with Paleo and non-Paleo eaters alike — and for good reason. It’s incredibly simple to make, very filling, and delicious, especially when toasted and topped with cheese or jam. The recipe is also easily customizable, so feel free to experiment with your own favorite combo of seeds and nuts. You can easily customize the recipe with your preferred nuts and seeds. Simply make sure that you follow a nuts to seeds ratio of 2 cups of nuts to 4 - 5 cups of seeds. Suggested nuts for addition/substitution: pecans, pine nuts, hazelnuts. Suggested seeds for addition/substitution: poppy. Preheat your oven to 350 degrees Fahrenheit. In a large mixing bowl, combine all ingredients. Mix thoroughly with a spatula or spoon. Pour your mixture into the pan, and level out the top with your spatula or spoon. Bake at 350 degrees Fahrenheit for 1 hour. Note that this is a very dense bread that won’t leaven. When finished baking, the loaf should sound hollow when tapped. and topped with cheese, pâté, jam, or luncheon meats. On second thought, it goes well with practically any type of spread or topping. This bread will keep in the refrigerator for around a week, and it also freezes very well. -- one for now and one for the freezer. Once you get a taste, you'll be glad to have another one on hand when you run out. OMG Susan. That looks fabulous.